Can a company’s performance on the stock market be predicted by the number of views and edits of its Wikipedia page? That’s the question researchers at the Warwick Business School in the United Kingdom set out to answer, and the answer is a qualified yes. 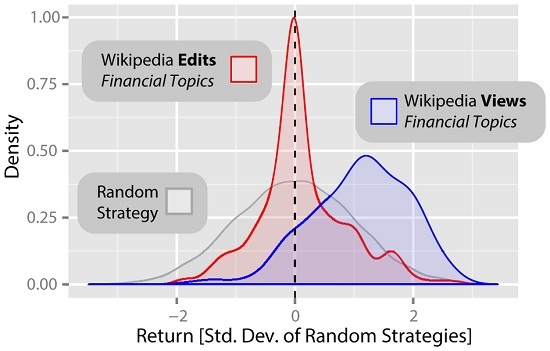 In a report recently published in Scientific Reports, a team of researchers led by Suzy Moat, a senior research fellow at Warwick Business School, found that changed and views to financially-related Wikipedia pages could be linked to subsequent movements of the Dow Jones Industrial Average. “These results provide evidence that online data may allow us to gain a new understanding of the early stages of decision making, giving us an insight into how people gather information before they decide to take action in the real world,” said Moat, in a statement. 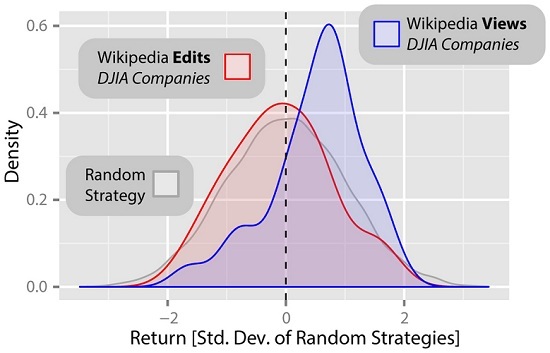 When examining how often the Wikipedia entries of the 30 companies listed in the Dow Jones Industrial Average were viewed over the last four-and-a-half years, the research found that a trading strategy based on the frequency of views would have yielded a 141 per cent profit, as illustrated by the chart below. Returns from trading strategies based on Wikipedia view and edit logs for articles relating to the companies forming the Dow Jones Industrial Average (DJIA). A strategy based on views of 285 pages related to general financial topics would have returned a 297 profit according to the researchers, while a buy and hold strategy over the same period would have yielded just a three per cent return, as shown by the chart below. Returns from trading strategies based on Wikipedia access and edit logs for pages relating to finance. While page views proved a profitable indicator, the researchers found no correlation between page edits and trading activity. While basing a trading strategy solely around such data is likely a risky proposition, it is an interesting real-world case study of big data in action, and how publicly accessible information on group behavior can be used to make better and more informed decisions.